I’m already feeling like I’ve had enough of winter. I’ve had enough of feeling tired and devoid of any mental strength; had enough of seeing the hours of days seep into the ground around me. I’ve had enough of interminable streams of sound and vision that reek of tedium and dull insipidness, turning over the soils of earnestness and emptiness. All of which sounds so desolate and damnably Emo, which is not the way it is meant to be of course. So what has excited me? 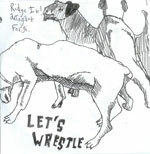 Well Let’s Wrestle have been playing non-stop on my stereo the past few days. I came across this bunch of 16 year olds courtesy of a demo CDR that Lawrence sent me. It may have been sitting in the post office for as much as two weeks, but I’m glad that it was only on the day before Christmas Eve that I was able to collect it, because there couldn’t have been any better Christmas present than these three tracks full of teenage wit and wisdom. I like to think that they took their name from the great David Shrigley book, because that would be immensely fitting, but being teenagers it's also entirely possible that they have spent too many hours fixating on WWF (teachers will know what I mean...). “This is the death of an indiepop fan” sings the marvellously monikered Wez Gonzalez and you can’t help but raise your glass and shout ‘salut’ in response. I mean, nothing against indiepop fans and all that (some of my best friends are indiepop fans…) but there is something gloriously special about singing a line like that. Especially at 16. And yeah, I know the old shtick from back in the day about Husker Du being part of that tired old Rock heritage, but man, I liked Husker Du and I don’t care. Not so sure about the line about wanting to sound like Led Zeppelin, mind you, but maybe it’s ironic. We can but hope. They don’t sound like Led Zeppelin at all of course. 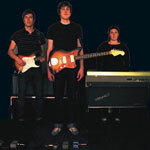 In fact they sound decidedly indiepop, but in a good way, naturally. Like in the way of Hefner, and you can’t say much better than that, can you? They also remind me of Esiotrot, though maybe Esiotrot with more of a Fall fixation, which is no bad thing either. In my dreams I see the two of them touring the country blowing up a storm in town pubs, seducing the teenage populace with their hilarious tales of angst and rage. Oh, and I mean that in the best possible way of course. For there is also something of the early Wedding Present to Let’s Wrestle. It’s not just in the way that the guitars go after each other and chatter magnificently in heady abandon, but it’s also in the way that the lyrics are so insanely self-possessed/obsessed. And maybe I am being terribly unkind and underestimating their intelligence and poise, but why are the sixteen year olds in my school not this cool? I blame the teachers. I look forward to more songs from this gang. They are bound to be ace. Jeffrey Lewis asked them to support one of his shows recently, and Lawrence roadied for them. How cool is that?! In the meantime I will be playing these three tracks to death. “One day I will find someone who likes reading comic books and drinking red wine” they sing on ‘Song for Abba tribute album’. Story of my life, man. Story of my life. Make ‘em the story of yours too. Okay, so having said how much I love the idea of a line that talks about the death of an Indiepop fan, I have to confess now that I’ve also been excited by The Electric Pop Group and their self-released eponymous album. And you couldn’t get much more definitively Indiepop than Gothenburg’s The Electric Pop Group if you tried. With a mid December release, it was a bit late to make it onto my mix-tape collections of favourite records of the year, but it most assuredly deserves a place in the highest reaches of that list. There have been few songs this year or ever that have matched up to the glorious sparkles of opener ‘Popgirly’, with it’s knowingly and lovingly Pop-obsessive lyrics and it’s chiming guitars swirling around your ears like warm summer winds. It has more than a nod to the Primal Scream sound of the mid 1980s too, which is nothing to be ashamed of. One suspects that Bobby Gillespie would thoroughly disapprove of course, but that pleases me immensely, what with those early incarnations being all but written out of official Primal Scream retrospectives. There are a load of Razorcut references in there too, and time and time again I’m reminded of the soaring chimes of freedom that reverberated through the fabulous Storyteller. Naturally one could go on and on with the list of reference points and the groups whose echoes invest this record with a shimmering heart of song, but it would inevitably be to take away from the mesmerisingly strong yet fragile individuality of the record. The Electric Group make a sound that is both studiously retrospective and thoroughly contemporary. Which is to say that it is contemporary with the notion that there is no contemporary sound at all any longer, except that of one’s own spectacularly special micro-scene – the sound that coalesces in the moment of an eyelash flicker and an imagined kiss that tastes of strawberry wine. And you can’t possibly ask for more than that. Also worth checking out from Sweden is On Trade Winds, the debut Air France record on the Tough Alliance’s Sincerely Yours label. The sleevenotes tell us that the track ‘Karibien’ is “loosely based on ‘Make You Understand’ by The Wake”, and that’s as good a reference point as any, for Air France really do tap into the same kind of aesthetic that those Factory funsters were making on Assembly and Here Comes Everybody. They share this with the likes of fellow Swedes The Boat Club, although both groups infect their bittersweet melancholia with a certain effervescent deftness of touch that lights up the pregnant winter skies, like the sound of Rothko painting Gauguin. I’m delighted too that On Trade Winds sees the light of day on Sincerely Yours. It’s one of my favourite record labels out there, the more so because most of their catalogue is filled with items that are not even records. Films, denim jackets, stencil art, arm bands, tributes to tennis starlets, bottles of white wine… most of it unattainable, which somehow makes it even finer. And The Tough Alliance of course still sound magnificent. Their ‘Silly Crimes’ track on the New Waves EP earlier this year was one of my favourite pop moments, whilst their cover of Rozetta Johnston’s terrific ‘Mine Was Real’ was similarly a real treat. Soul purists might take umbrage of course, but that’s all to the good. Nothing should be static. Everything is up for grabs. The Tough Alliance more than most seem to recognise this fact and plunder some fine sources of inspiration to create their own personal present. For whilst context is all, those contexts can be pushed and pulled, transported into new events that ripple with the reference of the ages. That’s the magic of Pop, after all. Speaking of references, there’s a neat one to the mighty Orange Juice in the title of A&B’s compilation of contemporary Scottish music. Get While The Getting’s Good has some truly remarkable tracks, not least the glorious opener ‘Barcelona’ by Jock Scot and the legendary Gareth Sager. Now I’m not one for Scottish stereotypes, but there is something about this just slightly slurred spoken word piece about buying whisky in Spain that tugs at my heart. Maybe it’s harder to rip your roots out of your heart that you think. Elsewhere there are delicious treats on offer from the likes of Camera Obscura, Tibi Lubin, The Secret Goldfish and Future Pilot AKA. For all the groups I know however, there are a load I wasn’t previously aware of. Of these, Bricolage’s spiky ‘Flowers of Deceit’ is a particular pleasure, whilst Popup’s hilarious ‘A Year In A Comprehensive’ is a glorious yelp in the Yummy Fur vein. Nineteen tracks all in, this is as fine a compilation as I’ve heard all year, and a perfect introduction to some contemporary sounds of (maybe not quite so young) Scotland. Now all we need is someone to do something similar for the underground indiepop sounds by the likes of Bubblegum Lemonade, though in these days of MySpace and iTunes, maybe we all have our own versions of those already? And on the subject of compilations, I’m assuming you’ve already picked up a copy of the very excellent Que Viva le Pop! collection that came courtesy of a joint venture between the Fortuna Pop and Elefant labels. Fortuna Pop offer up some choice cuts from a selection of their roster, with the mighty Would Be Goods, Lucksmiths and Butterflies Of Love being amongst my own favourites. The Elefant offerings are less well known to me, and apart from the tracks by Le Mans, Trembling Blue Stars and the seemingly ubiquitous Camera Obscura, these are all new to my ears. And even though I don’t understand a word of all the Spanish language tracks, it nevertheless all sounds terrific, from La Casa Azul’s spirited punk pop assault through Niza’s tweelectropop surge to Corazón’s orchestrated soft pop psychedlia. I can’t think of a finer introduction to two excellent labels.